get in the way of running your small business. You're our number one priority with Chicago Tax Accountants. Welcome to Chicago Tax Accountants from Del Real Tax Group. Our accounting staff has many years of extensive professional accounting and financial experience primarily geared toward small and medium sized businesses. We have a very personal and professional approach designed to provide the best service. Everyone in our organization becomes part of your team when you join our firm. 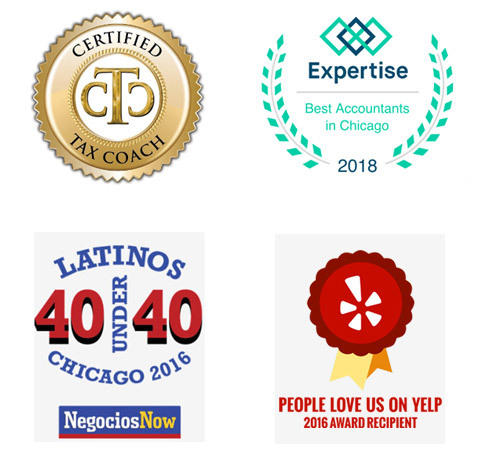 With a service area of 25 miles around Lyons, IL, our fully managed accounting services relieve you of as much of the financial and accounting work as possible while providing you the timely advice and financial reports that you need to best manage your business and achieve your business dreams. We have a solution for the small business owner that we offer for a fixed monthly fee. We do the bookkeeping, accounting, payroll processing, sales tax filings and income tax planning and preparation. Our firm focuses on the tax planning that we can do to lower your tax liability so that you can keep more of you earn. Discover how our team of experienced small business accountants can help you realize the dreams you have for your business, your family and your life. Experience the peace of mind that comes from having your own tax and accounting department supporting you while you devote more of your efforts to marketing and running your business. Our free e-book identifies how to maximize your small business profit and protect your assets. Complete the form below to receive your free copy! Our Small Business Service Package is a true solution for your business’ accounting and tax needs. Our package was designed to free up your time so you can focus on growing your business or enjoying life. As a business owner, your success depends upon your ability to focus on your core business while we maintain your bookkeeping and accounting records, balance your checkbook, and prepare financial statements and more. Have you ever thought about the biggest expense that many of us have? It’s probably our taxes. We work diligently with our clients to lower their tax burden. Everyone has dreams and can think of better ways to spend their money than in taxes. We are proactive and provide legal solutions that benefit your business by paying less taxes. We use your monthly financials as the foundation for our tax planning strategies. Our payroll service allows business owners to focus on growing their business while leaving payroll management to our expert accountants. Don’t let payroll and tax compliance become a burden. Small and medium sized businesses turn to us for quality payroll services delivered with confidence. Have the peace of mind of knowing that your payroll is prepared correctly while never having to worry about payroll tax penalties again.